MERRY CHRISTMAS from LUCENA!!! I didn’t get transfered! I was so worried that I might be transferred! I love the people here so much and I’m excited for the several investigators that we have! Being on a mission during Christmas is tough, but not as bad as I thought it would be! I’m feeling love from the members, fellow misisonaries, and the mission home! By the way, I broke the record for mail: biggest box in the San Pablo mission history so THANK YOU mom and dad. 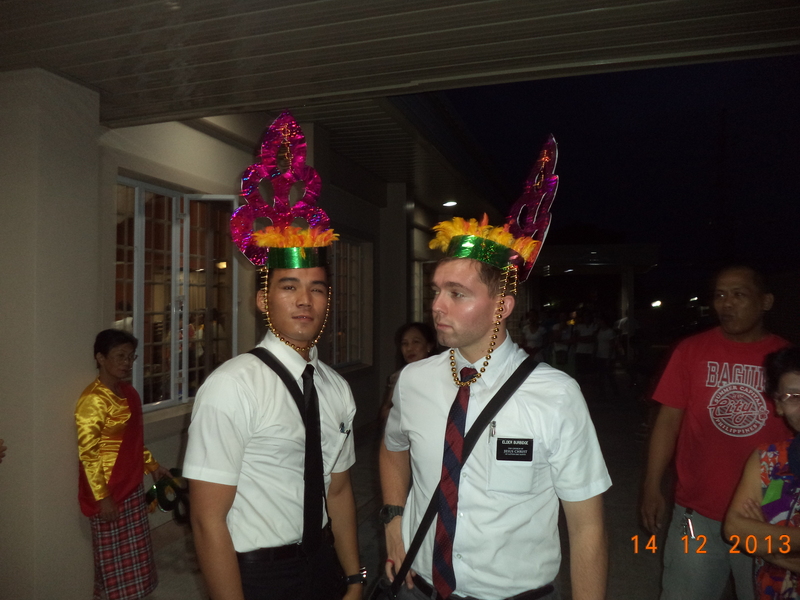 Elder Burbidge and his companion share in some Christmas merriment! The weeks are starting to feel like days! It is crazy that I’ve already been here for so long, right?? As the Christmas season hits with full force, don’t forget the reason why we celebrate! Jesus Christ is really the “reason for the season”. He has done and continues to do so much for us, I can’t express my gratitude. I’ve been studying some Christlike attributes and emphasized on patience. I’ve seen so many changes in my life and I know that i’m a happier person because of what I studied. Have a great Christmas this week! I love you all!